In other words? I’m ready for S-P-R-I-N-G! 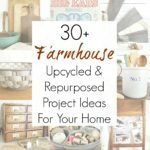 I’m already planning new projects- porch décor…bird feeders…gardening “helpers”…BUT I can’t help but reminisce about the upcycling projects for our yard that I finished last year. I picked out of a few of my favorites…perhaps you can use these as inspiration for the upcoming yard sale and vintage festival season! Find any new ideas? 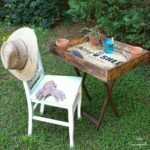 I just love figuring out new ways to add quirky, functional charm to our yard & garden with the help of vintage and second-hand treasures…and I’ve got new projects waiting patiently in the Sadie Seasongoods queue. But I yearn for new ideas- thankfully, my thinking cap has a wide brim and is proper gardening attire!! GOSH! All these projects are just wonderful! Hope you don’t mind if I ‘steal’ your ideas! LOVE your blog! Thanks so much – you are so creative! Vintage bucket stole my heart ! Thank you so much for linking up with iDEA boX ! Love the great ideas for the yard and garden! My favorites are the flower pot with the water spigot and the clock birdhouse. :O) Thanks for sharing. These are great! I love adding decorations to my yard. Thanks for some new ideas! You are so welcome, Pamela! These are great ideas! Love them all, but really love the water bucket. My favorite is the birdbath! These are all nice! I especially like the herb drying rack. I have an old frame in the basement so maybe I can make it. Guess I should plant some herbs, huh? LOL Thanks for sharing! Thanks for the invite- just linked up! Amazing ideas!!!! Cooommmee onnnnn warm weather!!! 🙂 Thanks for sharing at the Weekend Re-treat! I bet that your garden is just gorgeous! I had no idea that a bird bath should be fairly shallow, I am thinking of putting one in a corner garden spot, now I know what to look for. Thanks. Hi, Sarah ~ So many great ideas! I love using everyday items in unexpected ways. That Colander Hanging Planter is calling my name. :0) Thanks for the inspiration! 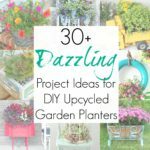 Love your upcycled yard and garden projects. My favorite is the planter with the water faucet. Too cute! I love these projects! I too enjoy making fun things for my garden. I actually have a bucket with a spigot that a friend made for my birthday years ago. It was a fountain, but I think it quit working. Wondering where it is. I still have a few things stored in a cubby area since we moved into this home. That was 5 years ago. I really need to pull everything out! Thanks for sharing with SYC. Sarah, I forgot to mention, I’m sure it’s not intentional, but I am not seeing a link back to the Share Your Cup Party. In order to be featured that is one of the requirements. Thanks, Jann- no worries. I had looked for a non-featured Link Party button to add to my sidebar but didn’t see one. So I’ve added a backlink to your page at the end of this post. Loving that colander hanging planter. Great ideas here! Thanks so much for sharing at Inspire Me Wednesday. Featuring you in next week’s issue. I have to say that I LOVE PINTEREST, I have found lots of ideas for the garden on there….just gotta find the time between life and rain to work up that new bed I have in mind! Love the bucket with the faucet knob coming up out of it. Thinking that will be one of my projects for my bed! thanks for sharing. love the spigot planter, adorable! Sarah, I picked your post as a feature this week on Vintage Charm 30. THANK YOU so much for sharing at Vintage Charm.